If you need to manage projects on the go The Best Free Project Management Tool for You The Best Free Project Management Tool for You You don't need Microsoft Project to manage a project. But which free project management tool is right for you? Use these strategic questions to choose. Read More , Wrike is a great choice. It gives you the project management features you’d expect, like Gantt charts, assignments, approval workflows, and time and budget tracking. Gamification is here to stay Gamify Your Life With A Few Clever iPhone Apps Gamify Your Life With A Few Clever iPhone Apps When you're feeling short on discipline, try supercharging your productivity and self-improvement with a little more fun using these iPhone apps. Read More . And Habitica is by far the most fun gamified iPhone productivity app. Enter your tasks and the daily/weekly/monthly habits you want to put in place, and start working. When you complete a task, you earn experience. You can use that experience to level up, get new gear, and battle monsters. While Evernote is still the king of note-taking apps, Bear is making strong inroads 10 Reasons Why Bear Notes Is Better Than Apple Notes 10 Reasons Why Bear Notes Is Better Than Apple Notes Bear is an excellent note-taking app for iPhone, iPad, and Mac. Here are several reasons it wins the Bear Notes vs. Apple Notes battle. Read More . Instead of being bloated with features, it aims for a minimal interface with pleasing typefaces and advanced markup features. There are a lot of great iPhone email apps 5 Intelligent iPhone Email Apps to Sort & Organize Your Inbox 5 Intelligent iPhone Email Apps to Sort & Organize Your Inbox It’s a good time to say goodbye to the Apple Mail app -- when so much of your work, personal and travel life revolves around email, it's just not enough. Read More , but few have security in mind. Edison Mail prevents email snooping with Touch ID or Face ID authentication. Microsoft’s note-taking app used to feel like a tacked-on addition to Microsoft Office. But updates to the app added many useful features, and it now rivals Evernote for the crown Evernote vs. OneNote: Which Note-Taking App Is Right for You? Evernote vs. OneNote: Which Note-Taking App Is Right for You? Evernote and OneNote are amazing note-taking apps. It's hard to pick between the two. We compared everything from interface to note organization to help you choose. What works best for you? Read More of best note-taking app. Having the ability to check your tasks in both Kanban and standard views makes this a great alternative to Trello Goodbye, Trello! 5 Alternative Free Kanban Board Tools Goodbye, Trello! 5 Alternative Free Kanban Board Tools Trello is an incredible app for project management and organizing your tasks. But there are other kanban apps that could be ideal for your tasks. Let's talk about the best Trello alternatives. Read More for people who want added flexibility. The calendar and to-do views also make this a versatile project management app. Gmail continually reinvents how we deal with email. And as it comes up with new ideas to test in the Inbox app, those ideas get moved to the Gmail app. With the latest Gmail redesign 5 Powerful New Gmail Features You Need to Start Using Right Now 5 Powerful New Gmail Features You Need to Start Using Right Now These new Gmail features from the Gmail redesign will help you manage your email better, faster, and with less hassle. Read More , you have access to lots of new features that will help you manage your email more efficiently. The premium version of TickTick offers calendar integration, custom smart lists, and even integration with Siri. 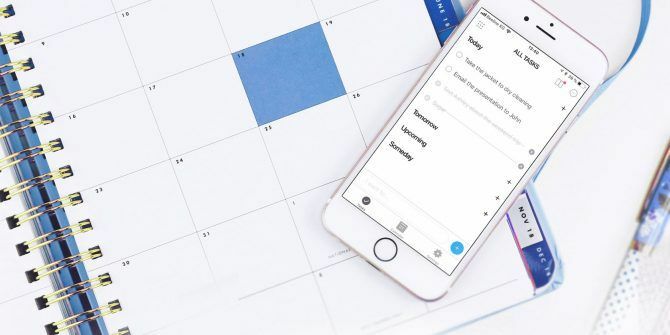 It also offers a task timer, which is great when you want to time block your tasks How to Block Time on Google Calendar for a Productive Workday How to Block Time on Google Calendar for a Productive Workday Do you struggle with time management? We show you how to block time on your Google Calendar to increase focus, reduce stress, and enhance productivity. Read More or you need to file reports for hourly billing. It’s easy to fall down the black hole of iOS productivity apps. Trying to find the best to-do list app 6 Utterly Simple To-Do List Apps for iPhone 6 Utterly Simple To-Do List Apps for iPhone Need a to-do list app for your iPhone but want to keep it simple? Here are some great minimalist to-do list apps for iOS. Read More can take weeks or months of trying out different options. Try a few of the apps above, pick a couple that work well for you, and start using them. You’ll develop habits and workflows that help you boost your productivity How to Increase Productivity According to Science How to Increase Productivity According to Science Have you tried most of the productivity advice out there, and nothing is working? Let science (and us) help you find what will work for you! Read More no matter which apps you choose! Explore more about: Calendar, Longform List, Note-Taking Apps, Productivity, Task Management, To-Do List. How does week plan not even make the list? Sorry to say, but Microsoft To Do will never be able to replace Wunderlist. Microsoft has destroyed a very useful product. I simply can't understand why they could not have left it as it was and maybe just tweaked a few things. It is a classic example of a big company taking over a small company, ruining the small company's great product or service, and forcing the customers to do business elsewhere. We all lose when this happens!